We specialize in the manufacturing and production of these 6 gallon all copper MOONSHINE STILLS which are handcrafted to perfection. Made using heavy gauge copper and lead free solder, our units are built to last. All of our units are water tested and have ZERO leaks. FREE SHIPPING!!! To the continental US. Hawaii and Alaska may be additional for shipping. Please contact us if you are from Hawaii or Alaska so we can go over shipping options. YOU need to own this unit. Whether it is for display as art, for fun, or for survival purposes, you will be satisfied with your product, or we guarantee your money back! 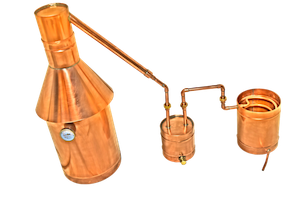 Completely Assembled Copper Moonshine Stills by The Distillery Network Inc. This unit is "Interchangeable" meaning it can be used with or without the thumper. 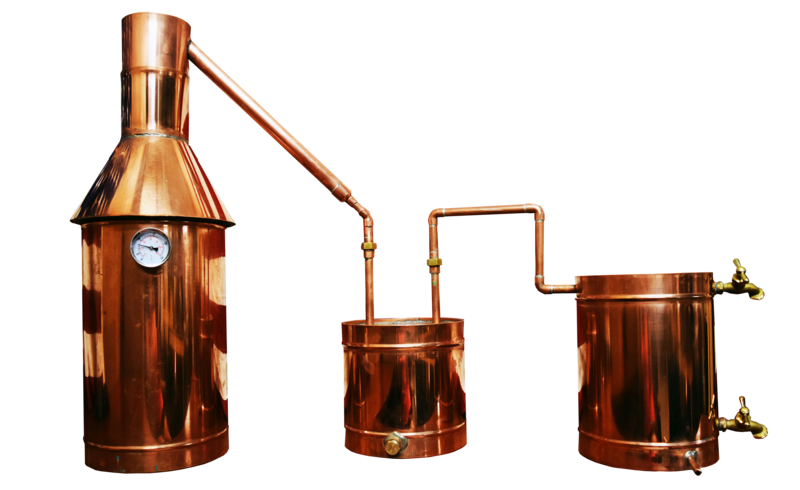 Buy a copper moonshine still online from the best in the business. 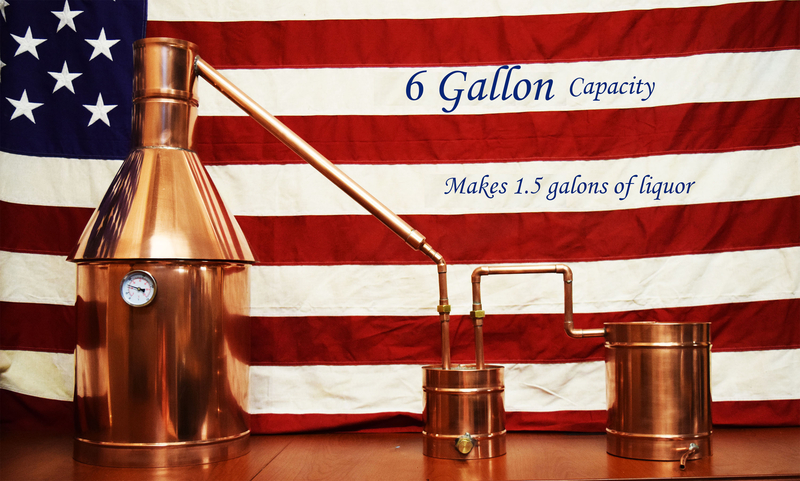 This 6 gallon copper moonshine still will fit six gallons of mash and run with either fire or an electric hot plate. This distillation unit comes full prepared and ready to use. Built with 20 oz. 22 Gage pure organic copper sheets which are lead free. We use the highest quality lead free brass fittings as well as temperature guage to ensure our customers satisfaction and safety. The copper pot measures 9 3/4 inches in diameter and stands roughly 28 inches tall. The thumper is 6 inches x 6 inches cylindrically. and the worm is 9 inches x 11 inches and comes with 5 or more coil spins for maximum cooling power. The coil in the worm measures 3/8 inches O/D. The Copper tubing coming out of the cap is 1 inch in diameter and the copper tubes connecting the thumper and worm measure 1/2 inch O/D. This distilling unit comes with a manufacturers Lifetime Warranty from The Distillery Network Inc. This warranty states that the first 30 days, the customer is not held responsible for any extra charges or fees. After 30 days, if there are any issues, all the customer has to do is pay for the shipping to our shop in Manchester, New Hampshire and pay for the shipping back to your location and we will pay for the copper and labor to fix any issue that may arise within the life of the purchased unit. Purchasing here is purchasing direct from the source, we build all of our units in our shop, here in America. We are standing by to help you purchase your first still! Shipping Time: Please allow 2 to 4 weeks to ship the unit. Please be patient while we complete your unit.